Can one reflect on ones own past at the age of ten? Aneti, the protagonist of the documentary film, already does. 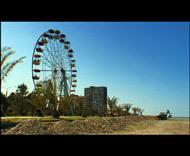 Expressions such as "in those days" and "when I was young" come incredibly naturally to the lips of this ten-year-old girl from the Georgian town of Batumi at the black sea. At eight years old, Aneti stood on the main stage of the national Opera and Ballet Theatre in Batumi. She wore a pink colored dress and with her strong voice sang the solo part of the princess Turandot into the fully sold-out hall. The adults applauded, inspired to realize how unusual it was to have the sole child opera star in the world in their small hometown. The political changes in Georgia and the fleeing of the generous promoter of Opera from the country led to the shutting down of the popular theater. Anetis pink dress landed in the public's memory archives and now belongs to the realm of "in those days", exactly as do the numerous appearances and the significant career of this charismatic, young girl with black, curly hair. 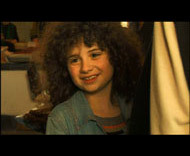 Aneti's life today, after the shutting down of the theatre, is the starting point for the story of the film. Aneti masters her everyday life between school, homework, the rigorous singing and piano instruction as well as the little bit of spare time overlooked by her ambitious mother. The observational documentary attempts to deal with her identity, and question the space between Aneti's real self and her image created by the adults surrounding her.